This is a mid century modern bar serving credenza by United. It has 2 flip top extension leaves with an ebonized formica top underneath. It has 1 dovetailed drawer with sculpted wood handles, a bottom storage cabinet, and sculpted tapered legs that have removable wheels for easy transport. Dimensions: 38″W (closed), 60″W (leaves open), 19″D, 34″H (with wheels), 32″H (without wheels),.Each leaf measures 15″W, middle section only is 30″W. 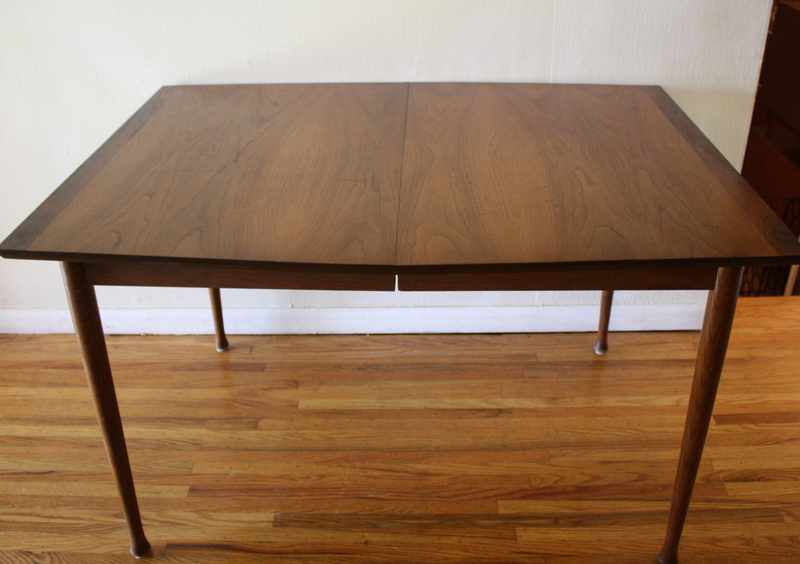 This is a mid century modern coffee table has a unique swivel design, mode design details on top and tapered legs. The extra table space stores underneath and can swing out when needed. Dimensions: Top table: 53″W x 18″D x 15″H. Bottom table 46.5″W x 18″D X 12.5″H. 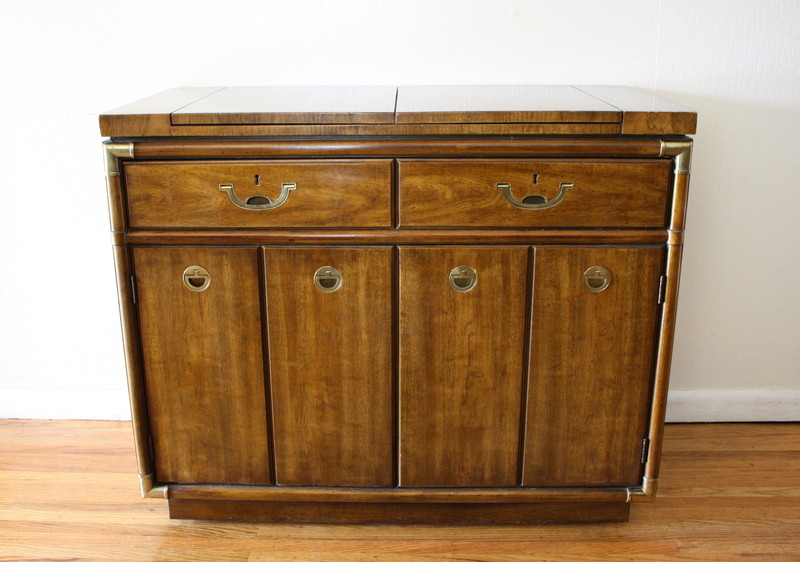 This is a mid century modern rolling bar serving cart with 2 bottom removable serving trays. It also has 2 hidden extension leaves. Dimensions: 26.5″W x 17.5″D x 27.5″H. 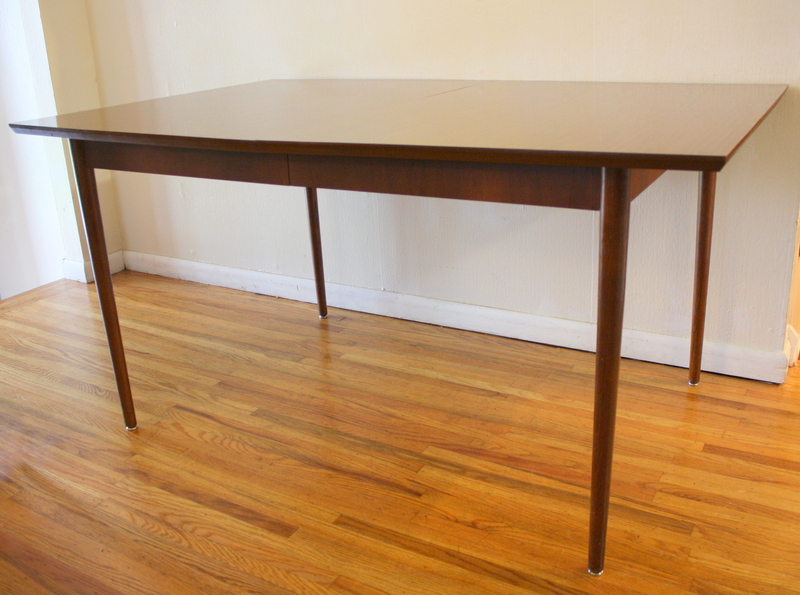 These are 2 mid century modern dining tables. The first table has the surfboard design detailed with parquet sides, tapered legs, and an extension leaf. The extension leaf is folded and hidden under the table for easy storage: 48″W x 36″D x 29.5″H, 60.5″W with extension leaf. 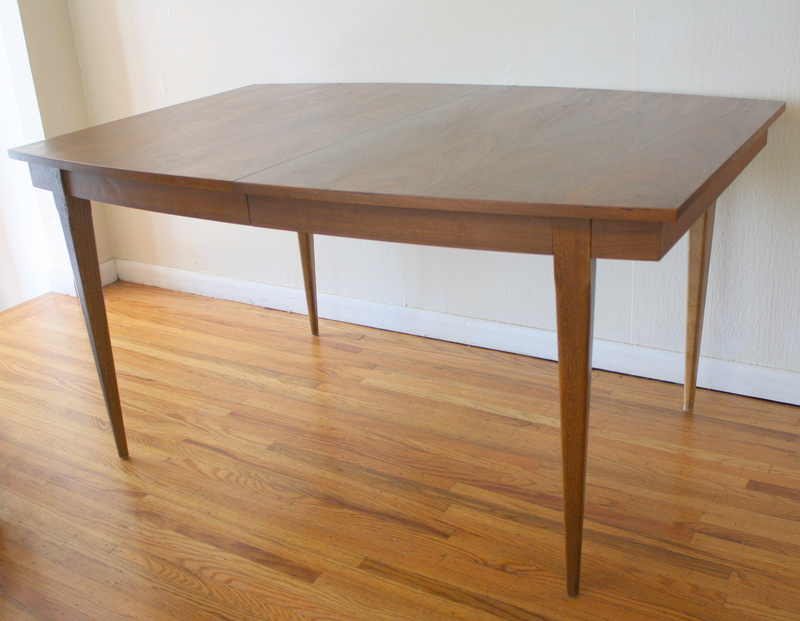 The second table also has the surfboard design, sculpted tapered legs, a gorgeous wood grain, and a removable extension leaf: 58″W x 40″D x 30″H. 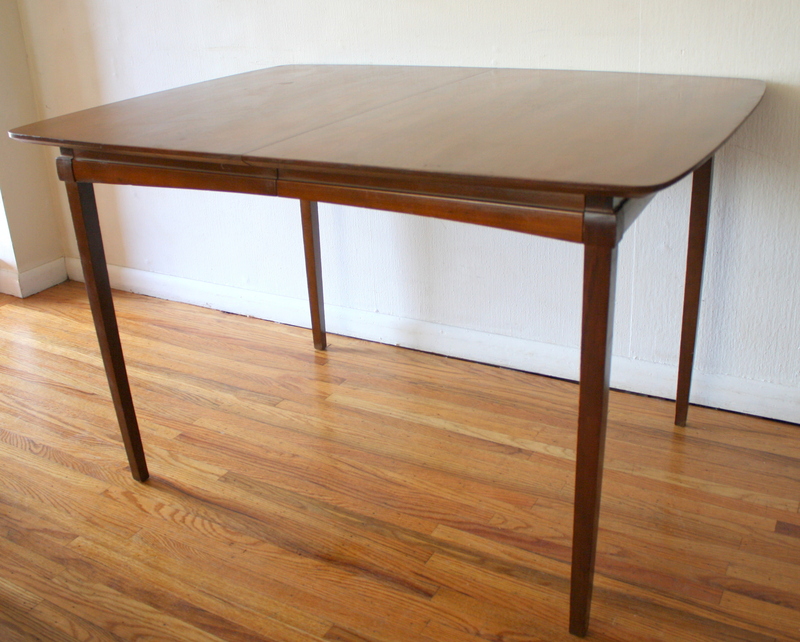 This is a mid century modern teak refractory dining table. It has 2 hidden leaves that extend for more surface space when needed. Dimensions: 43″W (leaves tucked in), 68″W (leaves extended) x 31″D x 28.5″H. 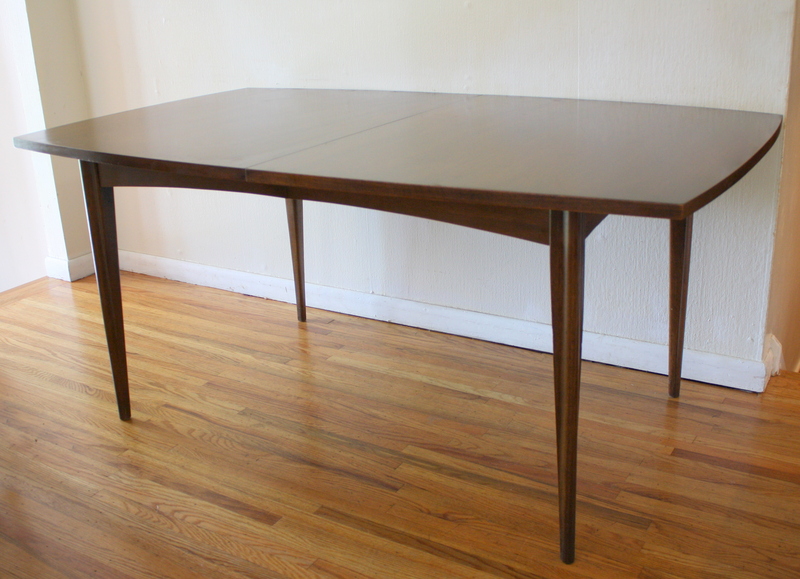 This is a mid century modern dining table with an extension leaf. It has a tapered surfboard shape and sculpted tapered legs. 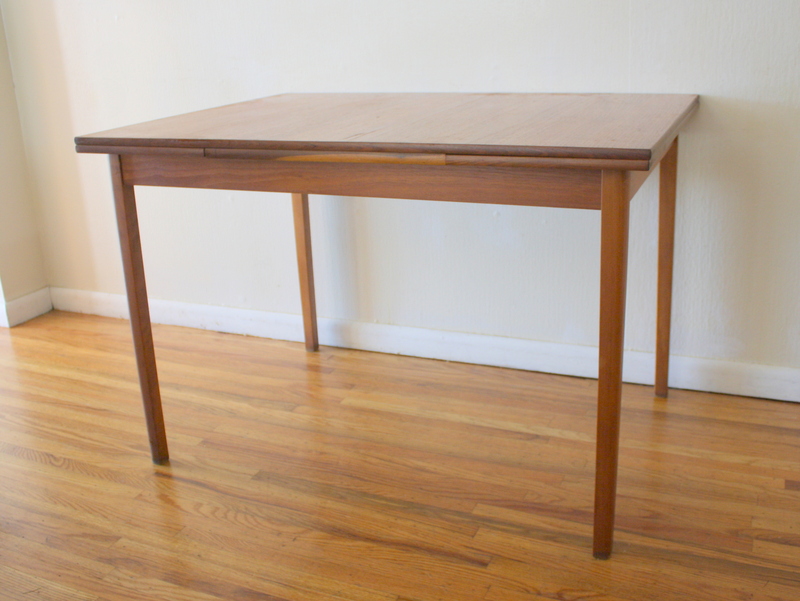 This table is particularly rare because of its initial compact square shape. Dimensions: 42″W (with leaf 60″wide) x 42″D x 29″H. It is pictured in its square shape with our Broyhill Brasilia dining chairs (sold separately) and it is also pictured with its extension leaf in a set of 6 dining chairs with sculpted backs (sold separately). 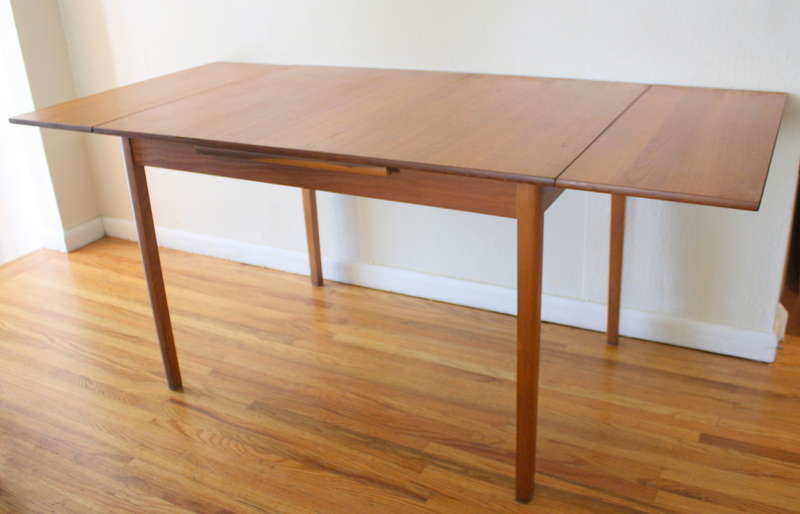 These are three different styles of mid century modern dining tables. 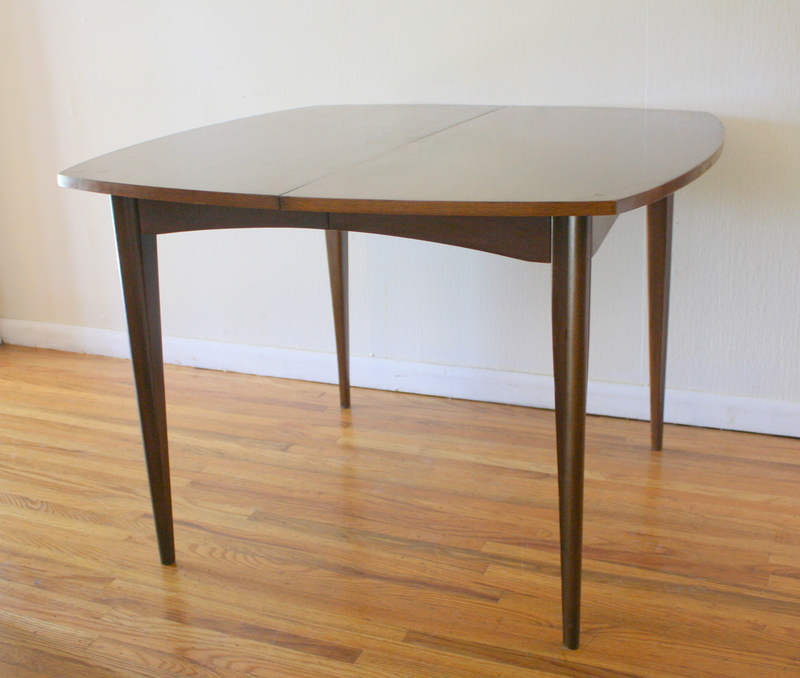 The first is a mid century modern round dining table with an extension leaf and a gorgeous sculpted base. 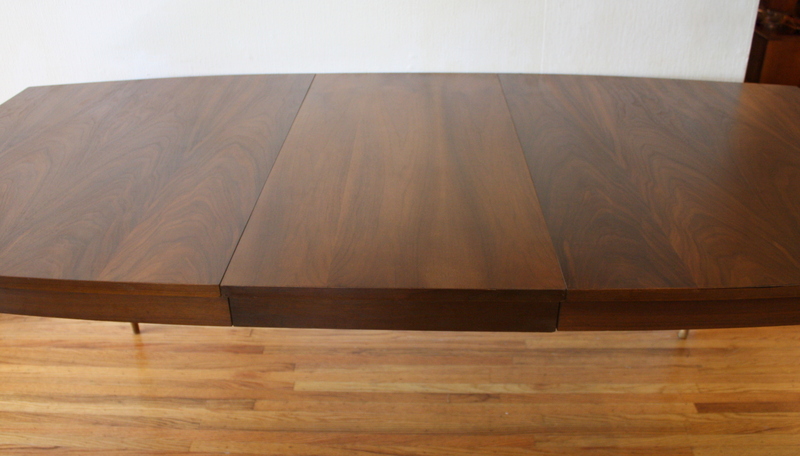 The second is a mcm surfboard dining table with tapered sides and sculpted legs. 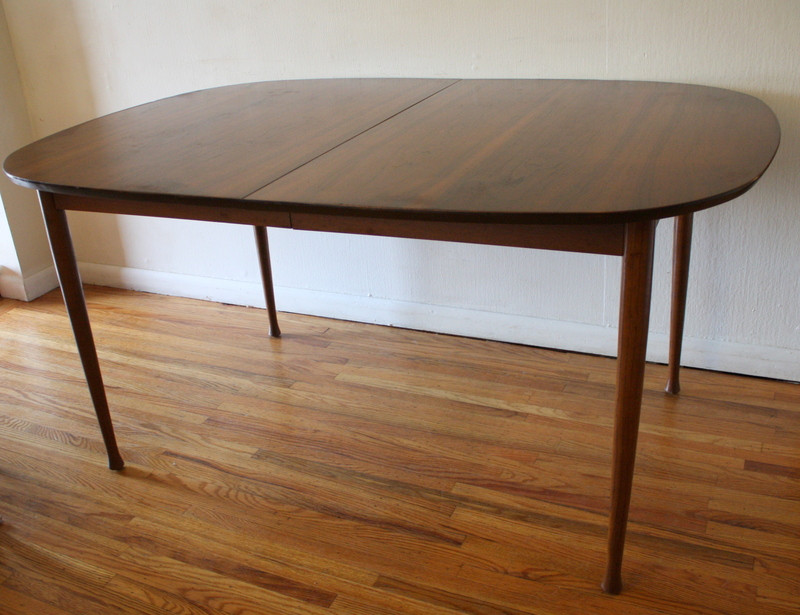 The third is a round dining table with a 2 extension leaves, a formica top, and tapered legs. 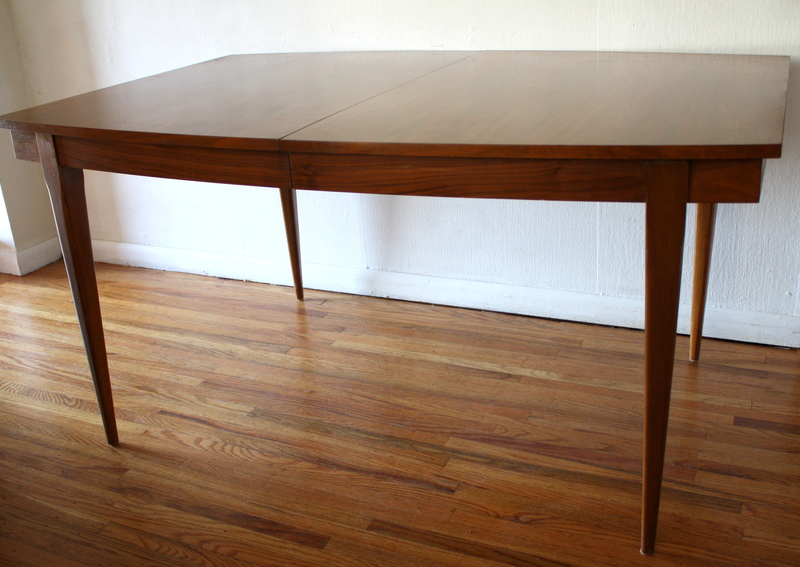 The fourth is a dining table by Drexel with a gorgeous wood grain.